This old fashioned, wholesome loaf is definitely one you’ll want in your favorite’s file. Soften the yeast in 1/2 cup warm water for 5 minutes. Add the sugar, 1 cup of the flour, 1 cup of the whole wheat flour and the rest of the water. Mix well and allow to stand for fifteen minutes. Mix in the salt, the butter, the oats, and the rest of the flour until a soft dough is formed. Dough should pull away from the sides of the bowl. Turn out on lightly floured surface and knead for 10 minutes. Knead in up to a cup of dried fruit and nuts if desired. Place in an oiled bowl, turning to oil all sides. Cover and let rise in a warm place for 1 hour or so, until doubled in bulk. Punch down and form into 2 or 3 loaves. Place in oiled pans and allow to rise until doubled, about 45 minutes. Brush with egg yolk wash if desired (1 egg yolk mixed with 1 tsp. water) and sprinkle oats over the top. Hi Marye, My name is Cathy Sinisi. You mentioned oil, in your; Old Fashioned Whole Wheat & Oatmeal Bread. But you didn’t put in in the recipe. Or the measurements. I can’t make it, if it’s not mentioned. Can you please put it in. Thx would appreciate it. It should have said butter – sorry about that..it’s fixed. I add 3cups of whole wheat flour and 3 cups of all purpose and two cups of rolled oats but the dough is not tacky I followed the recipe to the letter. Did it rise and bake ok? Start with the 2.5 cups flour each, then add more as necessary. Each packet of yeast is about 2.5 teaspoons so 1 tablespoon should be just about right. Homemade bread is so, so good. What a beautiful loaf! Love homemade bread!! I keep hearing wonderful things about oatmeal bread but I haven’t tried it yet. I will have to at some point! Love that you used whole wheat flour too. Love how wholesome this bread is, my family will love it! 🙂 Thanks! I hope they do! This is perfect! I love wheat bread, but only when it’s homemade – and I didn’t have a recipe on hand for it until now 😀 Thank you! I have a couple of good ones. The buttermilk whole wheat is softer then this one, though. What a gorgeous and delicious loaf, Marye. Love the old fashioned rolled oats. I love baking with yeast and I can tell this recipe is a real keeper! Would love a sandwich on this bread. This bread looks wonderful! I love the smell of bread baking in the oven. I know, right? It just smells so good. 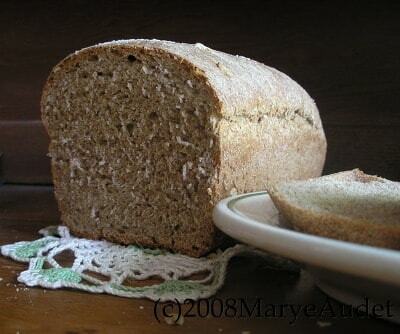 Marye this loaf looks wonderful – I bet your home smelled marelous! Do you use quick cooking oats or regular? How,can you tell if yeast is good? Add 1 tablespoon of yeast and 1 teaspoon of sugar to lukewarm water. It should foam up in 10 minutes. If it doesn’t it’s probably not good. When do I add the yeast? Hi, I just found your site and FB page and love it. I make mostly high protein low carb quick breads (gastric bypass patient). But I’d really like to make more yeast breads of the same time. This recipe looks close for a basic one. I’d like to find a way to add in soy or garbanzo bean flour and perhaps some powdered milk for more protein. As you probably know, Jeff, it’s largely a matter of experimenting. I do find that using a little gluten in the mix helps it rise when I’ve added other things. You can use melted butter rather than oil. You can also leave the fat out completely but the bread will be dry. You cannot substitute a fruit puree and get good results.If you want less fat (and this really isn’t much per serving) you can cut it in half. I would not take the fat out completely. Hope this helps. Is there a reason you have to use all purpose flour with this recipe? I would love to make this, but I don’t do white flour anymore. Actually it is bread flour that works the best. You can make it with whole wheat but it will be heavier and less fluffy. I found your buttermilk recipe on face book and glad I did since i ended on your page where I found a whole wheat and oatmeal bread. I am interested in a multi grain bread, just for better health and I enjoy the crunch. I thought of using whole wheat and whole grain in place of the white, Just not sure if white needs to be added for better results. Thanks, your page looks interesting. Looking forward to spending time on it. Thanks again for your time. Brenda – If you are using a Bosch then no, you probably won’t need white flour. If you are kneading by hand or in a Kitchen Aid you might want to add 2 tbs gluten in place of 2 tbs flour per cup to make it lighter. Thanks so much for reading and commenting! Can’t wait to try this recipe. Thanks for the tip about the ginger.